Penn started the season very well with 3 straight wins, but then dropped the next 3 to fall to .500. Their percentage stayed about the same until May 30, when a win over Yale Law School started a 4 game winning streak that seemed to be the lift they needed to distance themselves from equal wins and losses. However, the winning streak was followed by a 4 game losing streak allowing the end of the season to virtually match the beginning. They managed to win 15, lose 14, and tie 1. 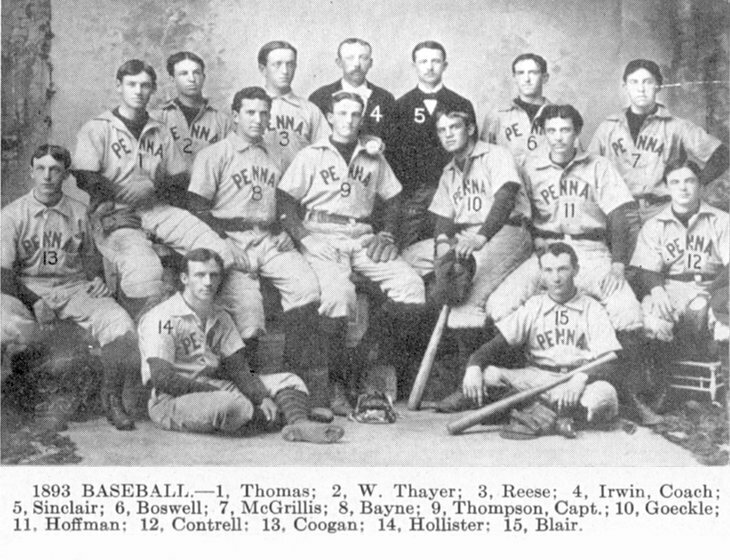 Four members of this team went on to play professional baseball: Coogan, Goeckel, Thomas, and Boswell. One player, McGrillis, had played professional ball the previous year. Note that the list of team members varies slightly from source to source. Included here is everyone named in the 1893 yearbook, the Athletic Association history of Penn athletics published in 1913, or both.